This handsome, traditional, restored, detached, granite stone house, on a quiet, residential lane in the country village of Coiro, is perched high above the Ria de Vigo in the lovely Morrazo peninsula. With spectacular views of the ria and coast and the fascinating city of Vigo beyond, it stands in extensive, beautifully maintained, fully enclosed grounds with a covered, salt water swimming pool, an orchard and a natural spring. Its stylish modern interior and very comfortable, modern furnishings and fittings, create a relaxing and soothing atmosphere with a touch of luxury. The inviting covered BBQ area with a bread oven too, provides a wonderful setting for al fresco meals, looking out over the magnificent panorama. An added bonus is a continental breakfast provided every morning and cleaning and change of linen every three days. Great for those in need of a real rest! The friendly village of Coiro, with its magnificent Baroque church, has a good, little supermarket, a bar and an excellent, family-run restaurant. At three kilometres, down below on the coast, is the busy fishing port and seaside town of Cangas with all facilities, including the ferry to the Islas Cies and the nearest beach. Front gate opens into grounds and house. Another gate alongside opens into the parking area. 2000m2 of beautifully kept grounds with covered, salt water swimming pool, an outhouse with a natural spring, an orchard and a large covered porch with a fixed BBQ and dining out area. Down the side of the house to the swimming pool area. Front door opens from this into spacious, open plan living room and kitchen. From this, cloakroom and "music room" with two armchairs and a music centre. Up stairs to the entrance (there is a door from this to steps which lead down to the grounds). Door from here to a bathroom and three bedrooms (one double with ensuite bathroom, one double and one twin). Bedroom Details: 1dble, 1 dble, 1 twin. (on first floor). 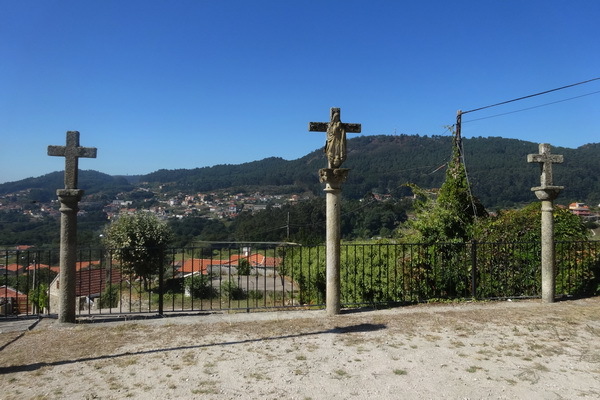 The village of Coiro with its famous Baroque church is perched high above the beautiful Ria de Vigo with the city beyond, and is backed by woods, offering good walking. It has a good, little supermarket with an excellent butcher's section, a friendly bar serving snacks, and a lovely, family run restaurant serving delicious food. At three kilometres down on the coast, is the nearest beach, and the busy fishing port and seaside town of Cangas, with most facilities including a covered market and two street markets a week. Across the ria is the major port and fascinating city of Vigo (accessible by road or ferry) and over the hills lies the ancient city of Pontevedra. Santiago de Compostela, and the north of Portugal are both within easy reach. You needn’t go far afield to find the excellent beaches and wonderful, little restaurants that abound in the Peninsula de Morrazo. Nearby, Moaña’s folk festival, held in August, brings performers and audience from all over Spain and beyond. Fantastic beaches nearby on the peninsula. 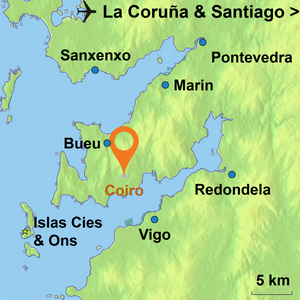 Walking routes on the Morrazo peninsula and along the Rio Mino. Try the Ruta dos Muinos de Coiro, taking in old watermills. Take the ferry across the Ria to the lively city of Vigo and feast on oysters there at one of the street stalls. Make a day trip by ferry from Cangas to the amazing Islas Cies with "the best beach in the world" & Ons National park. Celtic folk festival last week in July. Take a trip out to the mussel beds in the Ria. Visit Northern Portugal and its fascinating towns, just an hour away.